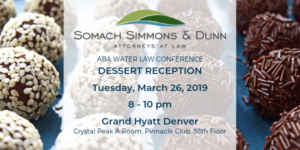 Please join Colorado Shareholders Sarah Klahn and Ramsey Kropf for a DESSERT RECEPTION during the ABA Water Law Conference in Denver. Cap off Day One of the ABA Water Law Conference with conversation and camaraderie, compliments of counsel at Somach Simmons & Dunn in Colorado and California. Enjoy a late night treat from our dessert bar, featuring an assortment of miniature sweets and specialty truffles. Locally sourced libations will complement our Mile-High nightcap reception with gorgeous views of Downtown Denver and surrounding areas. 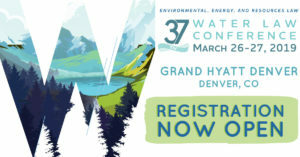 Taking place March 26 and 27, the 37th Water Law Conference is produced by the ABA Section of Environment, Energy and Resources. Attendees will benefit from CLE programming covering the most important topics affecting water law on national and local levels. Somach Simmons & Dunn is pleased to support the conference as a “Legal Leader” Sponsor. Sarah Klahn will serve as a session panelist for “East, West, Colorado, and the Colorado River.” This discussion will cover the foundations of water law, with insights for both new and experienced practitioners. From the basics to informative updates on topics with potentially broad applicability in the era of increasing water demand and less reliable water supplies, the Panelists will consider the law governing the Colorado River and features of Colorado’s unique form of prior appropriation that provides a valuable model on several issues facing all prior appropriation states and states struggling with groundwater and stream water interactions. Visit the conference website for a full agenda, registration fees, CLE credits, and more information. Somach Simmons & Dunn is one of the largest boutique water law firms in the West, with offices in Sacramento, California, Colorado and the District of Columbia. The firm’s 23 attorneys represent public and private sector clients across a range of water, air, and land disciplines, including litigation, transactional and public policy matters.